By Dennis W. Viau; modified from Internet recipes. 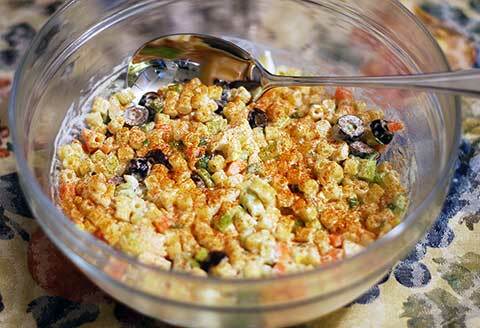 Macaroni salad is a simple and inexpensive side dish to enjoy with summer barbecues and picnics. There are many variations. Some people add chopped green and red bell peppers. You can include eggs, or not. Fresh garden peas would be an excellent addition — or even fruit, like grapes. Feel free to experiment with any fresh vegetables you like. Combine the mayonnaise, vinegar, mustard, sugar, salt, and pepper in a large bowl. Mix well. Add cooked macaroni, celery, green onion, carrot, and olives. Stir to coat ingredients evenly. Adjust for salt, if necessary. Add the chopped eggs and fold gently to distribute. Cover well and chill until needed. Garnish lightly with paprika for serving.